The growing problem of environmental quality deterioration due to the release of substances capable of inducing changes in the composition of atmosphere constitutes one of the hottest issues worldwide. The laboratory is participating in global efforts pointing towards the assessment of the problem by carrying out a study of the tropospheric degradation of chemical compounds initiated by the so-called "atmospheric detergents" (OH and Cl). The kinetics and the mechanism of chlorine atom reactions with halogen-, sulfur- and nitrogen- containing compounds, related with environmental problems, are studied by the very low pressure reactor (VLPR) technique, in collaboration with the Laboratory of Chemical Kinetics at the Department of Chemistry in the University of Crete. 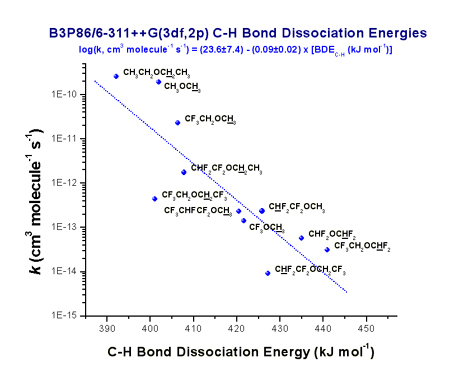 Earlier studies were focused on brominated and iodinated compounds, and the clarification of the effects of the halogen-atom adducts formation in the overall reaction mechanism. Recent studies involve the reaction mechanism and kinetics of Cl atoms with fluorinated ethers and alcohols as well as fluorinated alkenes, which are proposed as possible alternatives of chlorofluorocarbons (CFC), since the latter are very well known to be potentially harmful to stratospheric ozone and contribute significantly to the global warming. 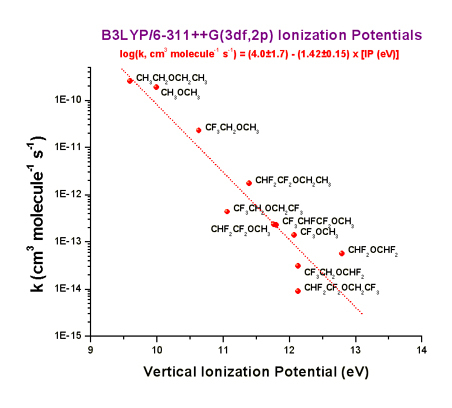 The availability of high performance electronic computers is continuously growing as an effective tool in achieving accurate thermodynamic properties of chemical compounds by electronic structure quantum-mechanical calculations. The knowledge of accurate thermodynamic properties permits the prediction of the molecular reactivity and gas-phase reaction mechanisms, directly applicable in the study of atmospheric degradation processes. 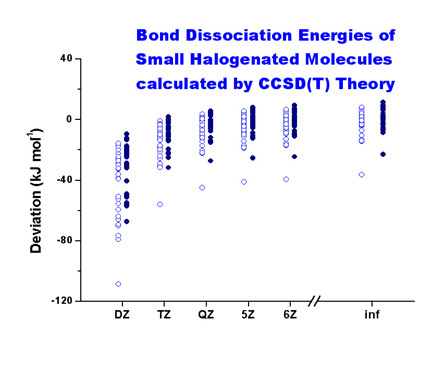 The laboratory has extensively examined the reliability for a plethora of model chemistries employing inexpensive density-functional theory (DFT) methods and infinite basis extrapolation methods in conjunction with coupled-cluster theory - CCSD(T) -, mainly for molecules containing all four halogen atoms (F, Cl, Br, and I). 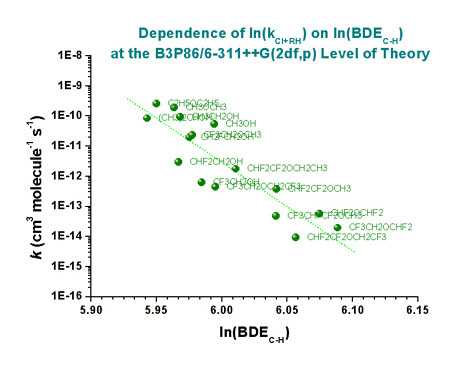 The superiority of the B3P86 functional in providing very accurate bond dissociation energies was the outcome of a relatively recent work, as well as that of the B3PW91 and B3LYP functionals is the determination of accurate enthalpies of formation and ionization potentials. Further work aiming at reducing the cost of CCSD(T) calculations in large molecules as well as providing approximations for the scalar-relativistic and core/valence correlation effects is currently in progress. The correlation of theoretically calculated molecular properties for extensive sets of compounds with kinetic parameters of their reactions with OH radicals and Cl atoms enables the construction of empirical expressions which may be used to predict their tropospheric reactivity. Furthermore, these expressions may suggest the optimal molecular structural features of molecules in order to be environment friendly. 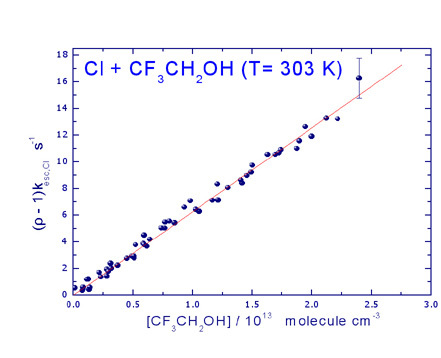 In recent studies, the correlation of calculated C-H bond dissociation energies and vertical ionization potentials with experimentally determined rate parameters for a series of fluorinated ethers was performed. The expressions derived permit the prediction of room-temperature rate coefficients with Cl atoms with an order of magnitude accuracy, using computationally affordable DFT calculations. Furthermore, it was shown that for fluorinated ethers and alcohols (proposed as alternatives to freons), high atmospheric reactivity (shortening their lifetimes and their consequent contribution to global warming) can be achieved by the presence of the -OCH3 or -CH2OH groups attached to a fluorinated alkyl chain whose structure can be freely tuned to attain the optimal physical properties.